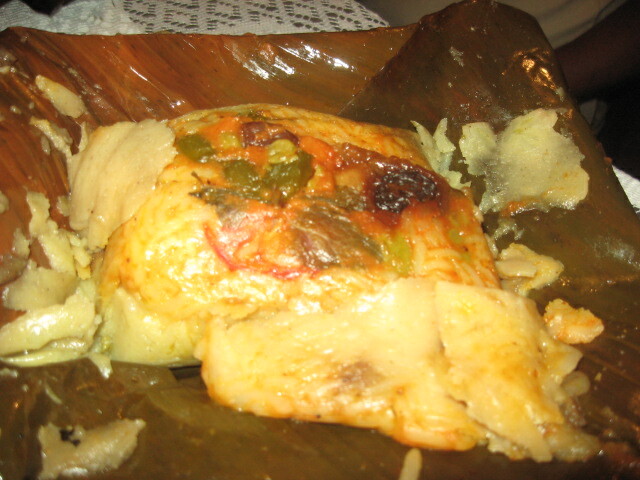 Nacatamals are a Nicaraguan specialty, similar to a tamal. 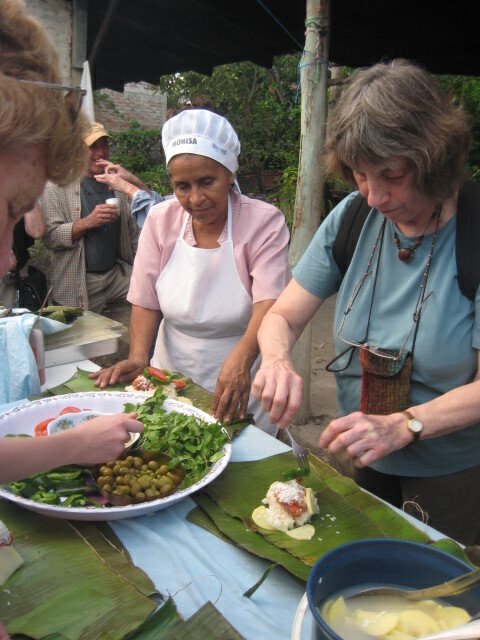 This evening we would have the opportunity to make Nacatamals as well as have a feast with our travel companions and hosts. 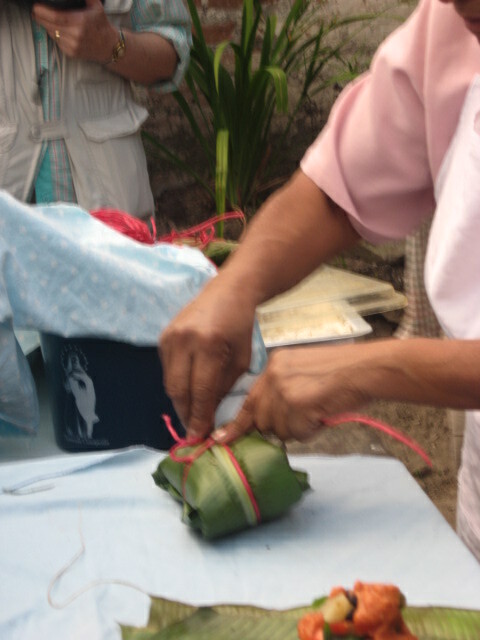 Nacatamals are prepared in homes in rural communities and often sold to neighbors on Saturdays. 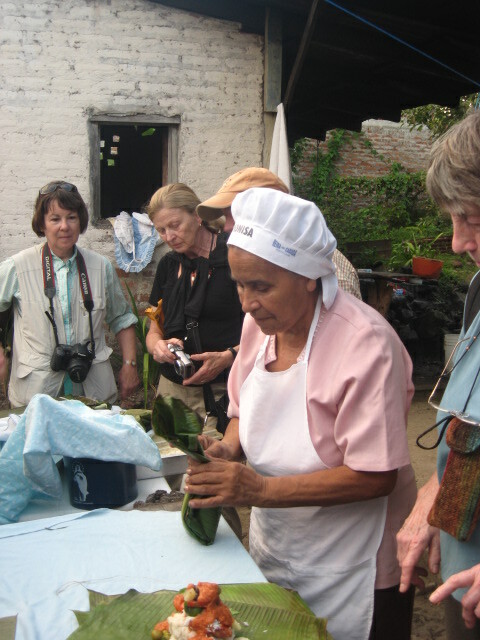 Our master chefs this evening are sisters that prepare Nacatamals for sale in the community. 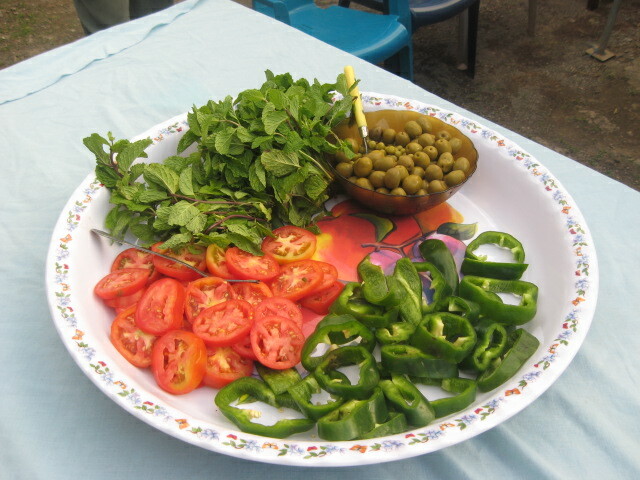 Nacatamals are traditional for special occasions and served to demonstrate hospitality to friends and visitors. 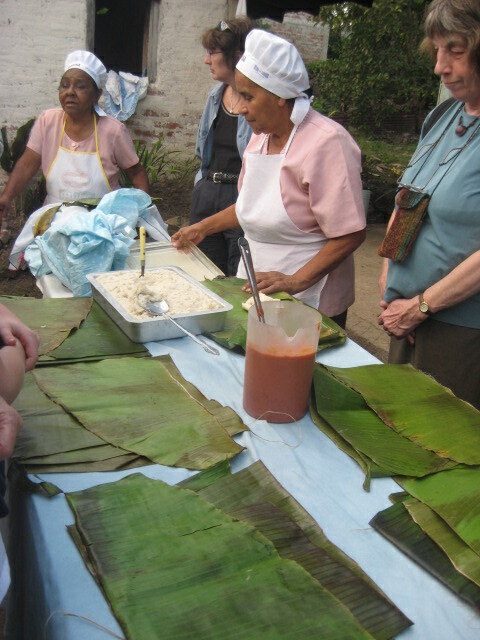 Nacatamals are a full meal and are traditionally served with Nicaraguan coffee. These are quite different from the tamales I have enjoyed for many years. We each made our own Nacatamal but due to the long cooking time, our creations were to be enjoyed (or tolerated) by the locals the next day. We were served perfect Nacatamals made by our hostesses that morning. They were flavorful and, oh, so filling. My sister-in-law and her husband, and other travel companions have made them at home with great success. One day, I too, will try, but today I will just enjoy the memory. Place the masa harina, lard or shortening and salt in the bowl of an electric mixer. Blend on a low speed to incorporate the fat into the masa harina and give it a mealy texture. You may have to do this and the next step in two batches if your mixer bowl is not large enough to hold all the ingredients without overflowing. With the mixer still on low speed, add the sour orange juice and enough chicken stock to make a soft, moist dough. It should be a little firmer than mashed potatoes. Increase the mixer speed to medium-high and beat for 2-3 minutes to incorporate some air into the masa and make it fluffier. Cover the bowl and set the masa aside to rest for at least 30 minutes. Season the pork with salt and pepper. Drain the rice. Assemble all of your filling ingredients and assembly items on a large table or work surface. Gather family and friends to help in an assembly line. Lay out a banana leaf square with the smooth side up. 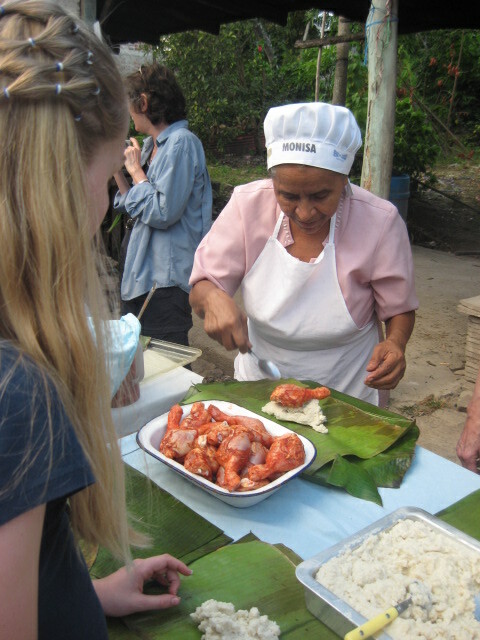 Place 1 cup of the masa in the middle of the banana leaf and, using wetted hands, spread it out a little. Put about 1/2 cup of pork on top of the masa and sprinkle 1 or 2 tablespoons of rice over the pork. Lay 1 or 2 slices of potato on top of the pork and then top with 1 or 2 pieces of onion, 1 or 2 pieces of pepper and a slice of tomato. Top it all off with a few mint leaves. 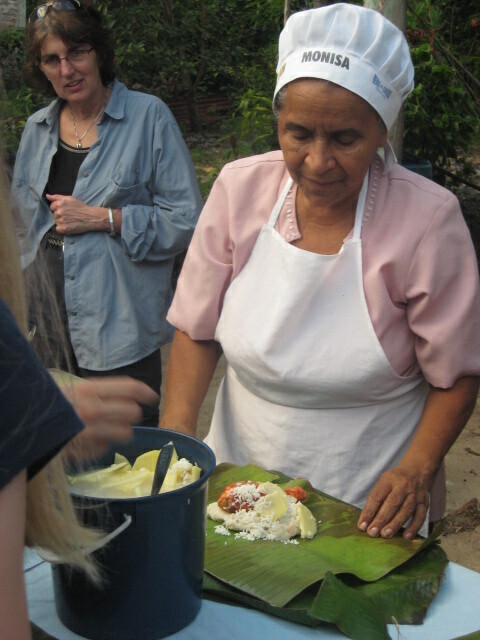 Fold the top edge of the banana leaf down over the filling. Bring the bottom edge of the banana leaf up over this. Then fold in both sides to make a rectangular package. Be careful not to wrap it too tightly or the filling will squeeze out. Flip the package over so it is seam side down. Set the tamal in the middle of an aluminum foil square and wrap it up tightly the same way you wrapped up the banana leaf. Set aside and repeat with the remaining ingredients to make 10 to 12 nacatamales in total. Add 2 or 3 inches of water to a tamalera or pot large enough to hold all the nacatamales. (You may have to use two pots if you don’t have one big enough to hold the nacatamales in one batch.) Place a rack in the bottom or toss in enough wadded up aluminum foil to hold the nacatamales mostly out of the water. Add thenacatamales and bring to a boil over high heat. Cover tightly, reduce heat to low and steam for 3 to 4 hours. Add more water as needed to keep the pot from boiling dry. Remove the nacatamales from the pot, take off their aluminum foil covering and serve hot. Each diner opens the banana leaf on his or her own nacatamal before eating. Masa Variations: This recipe uses masa made from masa harina flour. If you can find fresh masa, definitely use that instead. The flavor and texture will be better. A variety of ingredients can be added to the masa do give it more flavor. Substitute milk for some or all of the chicken stock. Add some chopped, cooked bacon, along with its fat. Add a cup or two of mashed potatoes to the dough. Mix in some chopped and sautéed onions, garlic or chile peppers. Meat Variations: Use chicken instead of pork. For more flavor, season the meat with some sour orange juice, ground achiote or paprika, cumin and minced garlic. Filling Variations: Many recipes call for adding a few green olives and raisins or prunes to the filling. Other ingredients sometimes added are capers, sliced hot chiles and even pickles. Vegetarian Nacatamales: eliminate meat, use butter, shortening or vegetable oil instead of lard and water or milk instead of chicken stock. You won’t find many Nicaraguans who will even touch this version. Wrapping: Banana leaves can be found in the frozen section of many Latino and Asian markets. If they aren’t available in your area, you can use a double layer of aluminum foil alone. You won’t get the extra flavor the banana leaves add though. 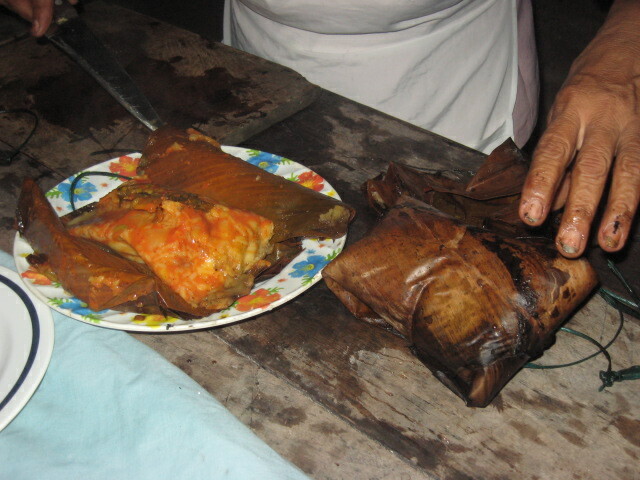 In Central America, nacatamales are usually wrapped in banana leaves alone and tied like a package with twine or the spines from the banana leaves. Sour Orange Substitute: If you can’t find sour orange (naranja agria) juice, substitute the juice of 1 orange and 2 limes.